I am in the midst of packing up after 29 years here on the farm. The more appropriate term would be an archeological dig. There are years of momentos being excavated. I did not save everything, but I saved a lot! Tooth fairy letters, preschool hand print calendars, drawings of “Me and Mom”-they were all catalogued (actually thrown in labeled boxes) for me to scrapbook later. Later never came. Life kept moving at a pace faster than the speed of sound and I thought someday I will have time to do this. Someday is here but we are moving. And I cannot bring 30 boxes of childhood memorabilia. So I sit night after night and move through layers of my life as a mother. Some treasures get sent to the artists. Others get posted on Facebook. And some move to the special box-those are the ones I still cannot part with after all these years. Do you remember when they were first born and they looked at you with that blank, squishy newborn face? You thought that they were the most beautiful baby in the world, birth road rash and all? You wondered what they would look like when they got older, who they would become, and what they would be like as a grownup. Later on as they grew and you looked back at those baby pictures you realized they were there-you just did not see it yet. As I have read piles of papers and looked at enough drawings to fill an art gallery, I can now clearly see the calling each of my children had at an early age. There was a theme or reverence and support for our nation’s military. Is it any wonder that they all chose to follow that calling once they became of age? I have laughed so much I have cried as I have looked at these wonderful creations. Yes I have been in tears remembering a simpler time when I could guard them all and keep them in the circle of safety that was our farmyard. 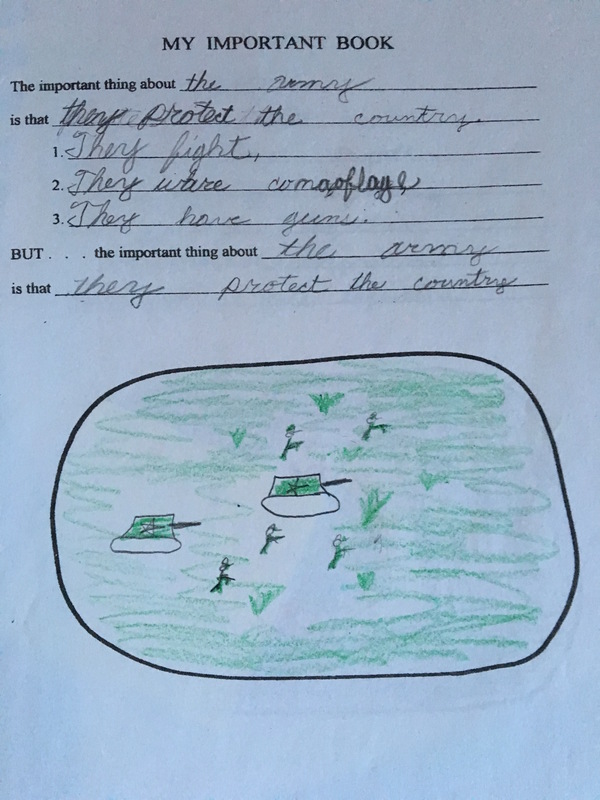 But I am thankful that they protect us as a future 9 year old Army officer wrote many years ago. He knew what was important even then. That is a lesson I wish I could teach everyone who is a citizen of this nation. Our military sons and daughters are a treasure. We ALL need to support them because they are IMPORTANT to our very existence as a nation. And after all they do wear cool camoflage. It seems like everyone wants to wear that these days. Thank you for the memories and your service kids!